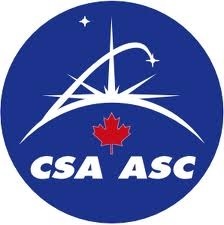 Although CANDELS is a photometric survey, many team members have proposed for and been granted observing time for CANDELS sources to obtain spectroscopy. Such additional data not only provides us with a more accurate measurement of the distances of galaxies (aka redshift), but also with additional information to decode their properties, such as how many stars they are forming and how much dust is contained in the galaxies. Figure 1: Example pointing for a MOS observation with the GMOS instrument at the Gemini Telescope. The image in the background shows the targeted sky area. The cyan outline shows the field of view of the instrument with the gaps between the 3 CCD detectors. The dashed outlined box shows the sky area in which the guide star needs to be placed. The red”arm” shows the arm that holds the camera that monitors the guide star. Classically, spectroscopy was carried out object by object, by placing one long slit where your one object is located. With this you restrict the area which lets light through to the detector to a narrow slit and blocking out everything else around it. The light that enters the prism or grism through this slit is then dispersed according to its wavelength, creating a spectrum of the object. Bright spots highlight the presence of elements that emit at this frequency/wavelength, and dark spots tell us where certain elements absorbed light and stopped it from reaching us. You can imagine though that carrying out such observations object by object is very time consuming. In the last decades though, astronomical studies for galaxy evolution started to greatly profit from new instrumentation which allows us to observe many objects at the same time. This is not only true for taking images of the sky, but also for spectroscopic observations. One method to take spectroscopy of many objects at the same time is grism spectroscopy, which we showed you in our post about grism spectroscopy with the Hubble Space Telescope. In that case nothing in your field of view is masked out and everything is dispersed. If your field of view is very crowded, meaning you have many many objects in your piece of sky, many spectra will overlap and will be hard to disentangle. and cyan diamonds for alignment stars). Another method is multi-object spectroscopy (MOS) via slit-masks. With this method you can take spectra for many objects at the same time by placing slits on many objects and blocking out the rest of the sky. This requires the creation of so-called MOS-masks in which the slit areas and the blocked out areas are clearly defined. This means that for every different observation you need a custom mask. Most current instruments require these masks to be prepared well in advance of the observation and to be cut out of plastic. This process isn’t feasible for a space telescope, but works very well on the ground. However, times are changing. For example, for the MOSFIRE (Multi-Object Spectrometer for InfraRed Exploration) instrument at the Keck Telescope, the masks are created on the fly and “bars” that create slits are then moved into the right position within the instrument. Also for the upcoming James Webb Space Telescope a MOS unit will be available. It is designed in such a way that little shutters open and close to produce slits and masked out areas. For many other instruments however, a mask is essentially one large piece of plastic that has lots of tiny slits cut out of it. The slits are placed exactly where you want to observe an object. To create such a mask is in principle relatively simple and I illustrate the process here with a series of images. I recently created some MOS masks for the Gemini Multi Object Spectrograph (GMOS) instrument at the Gemini Telescope to observe CANDELS galaxies and will use one of the masks I created as an example here to illustrate the process. Firstly, an image of the desired piece of sky in which the positions of the objects you want to observe are measured (Figure 2) and a list of objects, i.e. a catalogue, are required. From that list we picked our desired targets. Often these are selected based on specific properties and limited by their brightness to ensure the maximum success with the granted observation time. Then we also need a list of stars to guide the telescope and to align the mask properly. Guide stars are used to correct for the rotation of the Earth throughout the observation so that the telescope is pointing at the same portion of the sky the entire time. You can see an example pointing in the first figure. Figure 3: Zoom in [in original article] to show the placement of slits on some targets. Objects with blue triangles have highest priority, next are objects with green boxes, and then those with white circles. The yellow vertical stripes overlaid on an object show where the slit will be placed and cut out of the mask. The horizontal white lines mark the extension of the dispersed light, i.e. the spectrum of the object. Basically, all the light that hits the disperser when it comes through the vertically extended slit, is dispersed in the horizontal direction. Alignment stars are included on the mask to make sure all the slits are on the selected objects and not on some other piece of empty sky when the telescope operators define the pointing of the telescope. Then we take this image and list of targets and run them through the provided software for the given instrument. Usually, the original list of targets leaves room for other objects to be placed on the mask as well, so we basically work with a prioritized list of objects. The highest priority objects are “forced” onto the mask into the space left after placements of the alignment stars to observe as many as possible of the desired targets. Then any available gaps are filled with objects of lower priority. In Figures 3 and 4 you can see all the slits that were placed on this particular mask and a zoom in that shows you a slit. Figure 4: The finished mask. The red outline is the field of view of the instrument, the blue vertical lines mark the gaps in the detector. Each rectangle box shows where the spectrum of that object will extend. Yellow vertical lines mark the position of the slit on the selected object. The cyan rectangle boxes mark the position of the alignment stars. After this, the observer can manually remove objects that received a slit if he/she wants the software to pick out a different object for example, one that might be more optimally placed. Then there are usually a few iterations in which the slit placement is refined a bit more and the maximum amount of objects are placed on the mask. And that’s it, the mask is finished. All that is left to do is create all the masks for all the pointings in the same manner and then sending them off to the telescope and instrument support team for checking and approval. Once a mask is approved, all the necessary information is send to the mask cutting team who cut the mask, meaning all the tiny slits are cut out. After masks are cut, they will be installed in the instrument and then it’s anxious waiting for us for the completion of your observations if they are carried out by the support astronomers at the observatory (Figure 5) or hoping for good weather if we go to the telescope ourselves to carry out the observations. The CANDELS fields are currently targeted by astronomers all over the world with many observational programs on instruments such as DEIMOS (on the Keck Telescope), MOSFIRE (on the Keck Telescope), GMOS (on the Gemini Telescopes, described in this post) and VIMOS (at the VLT, for example with the VIMOS UltraDeep Survey). Figure 5: Example observation from one of the GMOS masks. Each horizontal package of lines is the dispersed light from one slit. The bright vertical lines (a few are highlighted by the violet arrows) are emission lines caused by the night sky, meaning elements in our atmosphere emit light at certain wavelengths which are also detected and then overlap with the spectrum of the target object. The spectral traces of the target objects are highlighted by red arrows and are faint horizontal lines. In the red box, we can clearly see 2 bright dots, these are emission lines in the target object which we can use to determine its redshift and other properties. The green arrows point towards high energy cosmic rays that hit the detector and cause a detection. In order to retrieve the spectra for the target objects, astronomers have to remove the cosmic rays and subtract the spectrum of the night sky, so that ideally only the spectra of the real targets are left in the end. In late 2009, the Hubble Space Telescope began an ambitious program to map five carefully selected areas of the sky with its sensitive near-infrared camera, the Wide-Field Camera 3. The observations are important for addressing a wide variety of questions, from testing theories for the birth and evolution of galaxies, to refining our understanding of the geometry of the universe. This is a research blog written by people involved in the project. We aim to share some of the excitement of working at the scientific frontier, using one of the greatest telescopes ever built. We will also share some of the trials and tribulations of making the project work, from the complications of planning and scheduling the observations to the challenges of trying to understand the data. Along the way, we may comment on trends in astronomy or other such topics. CANDELS stands for the Cosmic Assembly Near-infrared Deep Extragalactic Legacy Survey. It builds on the legacy of the Hubble Deep Field, as well as the wider-area surveys called GOODS, AEGIS, COSMOS, and UKIDSS UDS. The CANDELS observations are designed to search for galaxies within about a billion years of the big bang, study galaxies at cosmic high-noon about 3 billion years after the big bang – when star-formation and black hole growth were at their peak intensity – and discover distant supernovae for refining our understanding of cosmic acceleration. You can find more details, and download the CANDELS data, from the CANDELS website. You can also use the Hubble Legacy Archive to view the CANDELS images. When you look up on a clear night and see stars, what are you really looking at? A twinkling pinprick of light with a hint of colour? Imagine looking at a starry sky with eyes like prisms that separate the light from each star into its full rainbow of colour. Astronomers have built instruments to do just that, and spectroscopy is one of the most powerful tools in the astronomer’s box. The technique might not produce the well-known pretty pictures sent down by the Hubble Space Telescope, but for astronomers, a spectrum is worth a thousand pictures. Visible spectra reveal huge amounts of information about objects in the distant cosmos that we can’t learn any other way. Spectroscopy is the process of separating starlight into its constituent wavelengths, like a prism turning sunlight into a rainbow. The familiar colours of the rainbow correspond to different wavelengths of visible light. The human eye is sensitive to the visible spectrum – a narrow range of frequencies among the entire electromagnetic spectrum. The visible spectrum covers wavelengths of roughly 390 nanometers to 780 nanometers (astronomers often use units of Angstroms (10-10), so visible light spans 3,900 to 7,800 Angstroms). Once visible starlight reaches the curved primary mirror of a telescope, it is reflected toward the focal point and can then be directed anywhere. If the light is sent directly to a camera, an image of the night sky is seen on a computer screen as a result. If the light is instead sent through a spectrograph before it hits the camera, then the light from the astronomical object gets separated into its basic parts. 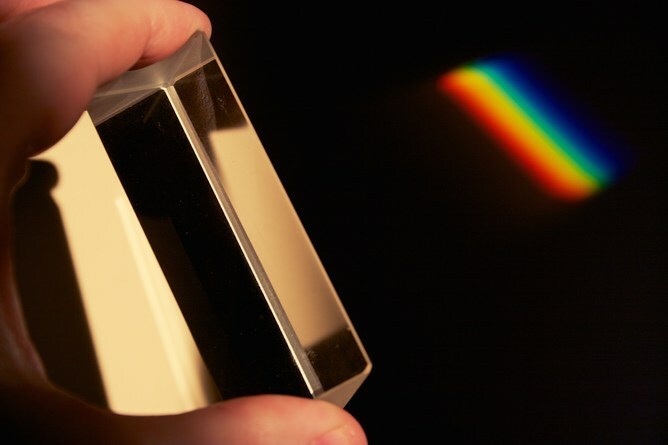 A very simple spectrograph was used by [Sir] Isaac Newton in the 1660s when he dispersed light with a glass prism. Modern spectrographs consist of a series of optics, a dispersing element and a camera at the end. The light is digitised and sent to a computer, which astronomers use to inspect and analyse the resulting spectra. The video (above) shows the path of distant starlight through the 4-metre Anglo-Australian Telescope (AAT) and a typical spectrograph, revealing real data at the end. What do spectra teach us? 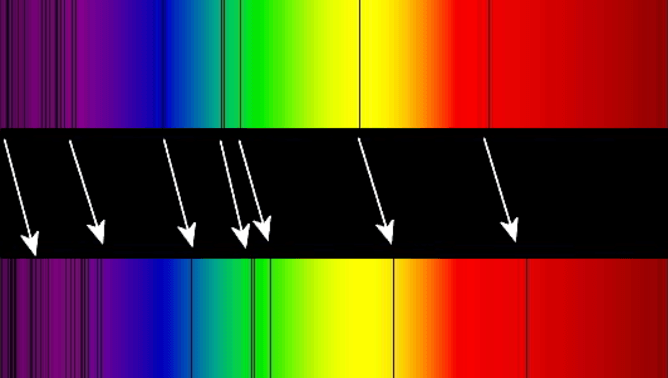 A spectrum allows astronomers to determine many things about the object being viewed, such as how far away it is, its chemical makeup, age, formation history, temperature and more. While every astronomical object has a unique rainbow fingerprint, some general properties are universal. Here we examine the galaxy spectra shown in the video. The spectrum of a galaxy is the combined light from its billions of stars and all other radiating matter in the galaxy, such as gas and dust. In the top spectrum you can see a few strong spikes. These are called “emission lines” and occur at discrete wavelengths due to the atomic structure of atoms as electrons jump between energy levels. The hydrogen spectrum is particularly important because 90% of the normal matter in the universe is hydrogen. Because of the details of hydrogen’s atomic structure, we recognise the strong hydrogen-alpha emission line at roughly 7,500 Angstroms in the top spectrum image. In a galaxy, only the youngest, biggest stars are hot enough to excite surrounding hydrogen gas enough that the electrons populate the third energy level, before falling to the second lowest, thus emitting a hydrogen-alpha photon. Because of this, we know the strength of the hydrogen-alpha line in a galaxy’s spectrum indicates how many very young stars there are in the galaxy. Since the bottom spectrum shows no hydrogen-alpha emission, we can conclude that the bottom galaxy is not sparking new life in the form of shining stars, while the top galaxy harbours several hard working stellar nurseries. In the bottom spectrum you can see a number dips. These are called “absorption lines” because they appear in the spectrum if there is anything between the light’s source and the observer on Earth absorbing the light. Absorbing material could be the extended layers of a star or interstellar clouds of gas or dust. The absorption lines close to each other below 5,000 Angstroms in the bottom spectrum are the calcium H and K lines and can be used to determine how quickly stars are zooming around the galaxy. In a galaxy how far away? A basic piece of information derived from a spectrum is the distance to the galaxy, or specifically, how much the light has stretched during its journey to Earth. Because the universe is expanding, the light emitted by the galaxy is stretched toward redder wavelengths as it innocently moves across space. We measure this as redshift. To determine the exact distance of a galaxy, astronomers measure the well-studied pattern of absorption and emission lines in the observed spectrum and compare it to the laboratory wavelengths of these features on Earth. The difference tells how much the light was stretched, and therefore how long the light was travelling through space, and consequently how far away the galaxy is. In the top galaxy spectrum mentioned earlier, we measure the strong red emission line of hydrogen-alpha to be at a wavelength of roughly 7,450 Angstroms. Since we know that line has a rest wavelength of 6,563 Angstroms, we calculate a redshift of 0.13, which means the light was travelling for 1.7 billion years before it reached our lucky telescope. The galaxy emitted that light when the universe was roughly 11.8 billion years old. Australia has led the way internationally for spectroscopic technology development for the last 20 years, largely due to the use of fibre optics to direct galaxy light from the telescope structure to the spectrograph. A huge advantage of using optical fibres is that more than one spectrum can be obtained simultaneously, drastically improving the efficiency of the telescope observing time. 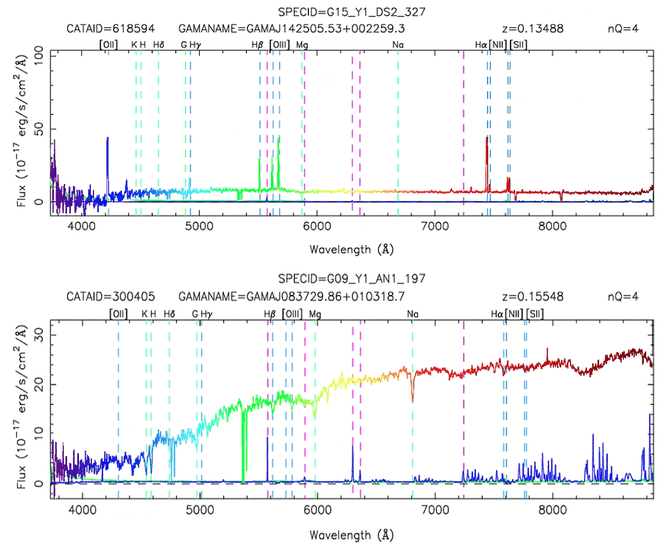 and the UK Schmidt Telescopes (both located at Siding Spring Observatory in New South Wales) have collected spectra for a third of all the 2.5 million galaxy spectra that humans have ever observed. While my own research uses hundreds of thousands of galaxy spectra for individual projects, it still amazes me think that each one of these spectra are composite collections of light created by hundreds of billions of stars gravitationally bound together in a single swirling galaxy, many similar to our own Milky Way home. NASA technologists have hurdled a number of significant technological challenges in their quest to improve an already revolutionary observing technology originally created for the James Webb Space Telescope. The team, led by Principal Investigator Harvey Moseley, a scientist at NASA’s Goddard Space Flight Center in Greenbelt, Maryland, has demonstrated that electrostatically actuated microshutter arrays — that is, those activated by applying an specific voltage — are as functional as the current technology’s magnetically activated arrays. This advance makes them a highly attractive capability for potential Explorer-class missions designed to perform multi-object observations. Progress, she said, is in large part due to the fact that the team successfully eliminated all macro-moving parts — in particular, a large magnet — and dramatically lowered the voltage needed to actuate the microshutter array. In addition, the team applied advanced electronic circuitry and manufacturing techniques to assure the microshutter arrays’ dependable operation in orbit, Li added. Considered among the most innovative technologies to fly on the Webb telescope, the microshutter assembly is created from micro-electro-mechanical technologies and comprises thousands of tiny shutters, each about the width of a human hair. Assembled on four postage-size grids or arrays, the 250,000 shutters open or close individually to allow only the light from targeted objects to enter Webb’s Near Infrared Spectrograph (NIRSpec), which will help identify types of stars and gases and measure their distances and motions. Because Webb will observe faint, far-away objects, it will take as long as a week for NIRSpec to gather enough light to obtain good spectra. NIRSpec’s microshutter array, however, enhances the instrument’s observing efficiencies. It will allow scientists to gather spectral data on 100 objects at a time, vastly increasing the observatory’s productivity. When NASA launches the Webb telescope in 2018, it will represent a first for multi-object spectroscopy. This image shows a close-up view of the next-generation microshutter arrays during the fabrication process. The technology advances an already groundbreaking multi-object observing technique. Determined to make the microshutter technology more broadly available, Goddard technologists have spent the past four years experimenting with techniques to advance this capability. One of the first things the team did was eliminate the magnet that sweeps over the shutter arrays to activate them. As with all mechanical parts, the magnet takes up space, adds weight, and is prone to mechanical failure. Perhaps more important, the magnet cannot be easily scaled up in size without creating significant fabrication challenges. As a result, the instrument’s field of view — that is, the area that is observable through an instrument — is limited in size. This greatly impedes next-generation space observatories that will require larger fields of view. Magnetic activation also takes longer. With the Webb telescope, the magnet must first sweep over the array to open all the shutters before voltages are selectively applied to open or close specific shutters. To accommodate the needs of future observatories, the team replaced the magnet with electrostatic actuation. By applying an alternating-current voltage to electrodes placed on the frontside of the microshutters, the shutters swing open. To latch the desired shutters, a direct current voltage is applied to electrodes on the backside. In other words, only the needed shutters are opened; the rest remain closed. “This reduction in cycles should allow us to extend the lifetime of the microshutter arrays 100 times or more,” Li explained. And because the magnet no longer dictates the size of the array, its elimination will allow scientists to assemble much larger arrays for instruments whose fields of view are 50 times larger than Webb’s NIRSpec, she said. Just as significant is the voltage needed to actuate the arrays. When the effort first began four years ago, the team only could open and close the shutters with 1,000 volts. By 2011, the team had slashed that number to 80 volts — a level that still could exceed instrument voltage specifications. By last year, the team had achieved a major milestone by activating the shutters with just 30 volts — a voltage sweet spot, Li said. “But we also did something else,” she added. 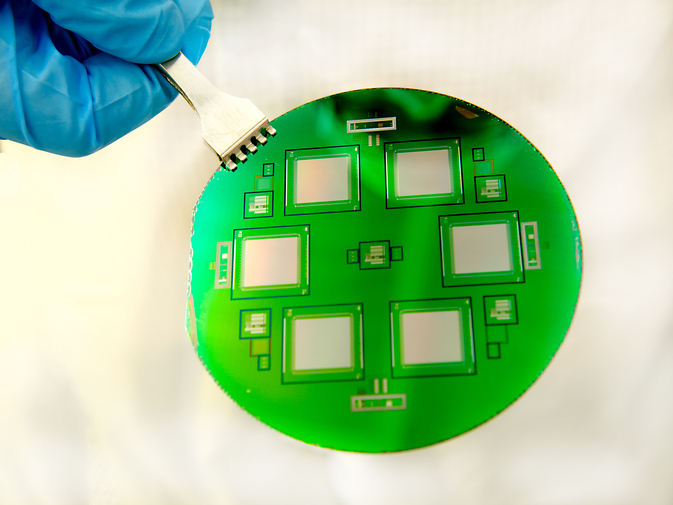 Through experimentation, the team used atomic layer deposition, a state-of-the-art fabrication technology, to fully insulate the tiny space between the electrodes to eliminate potential electrical crosstalk that could interfere with the arrays’ operation. The team also applied a very thin anti-stiction coating to prevent the shutters from sticking when opened. Before applying the coating, a 3,000-cycle laboratory test indicated that a third of the shutters stuck. After coating them, the team ran a 27,000-cycle test and not a single shutter adhered to the sides, Li said. 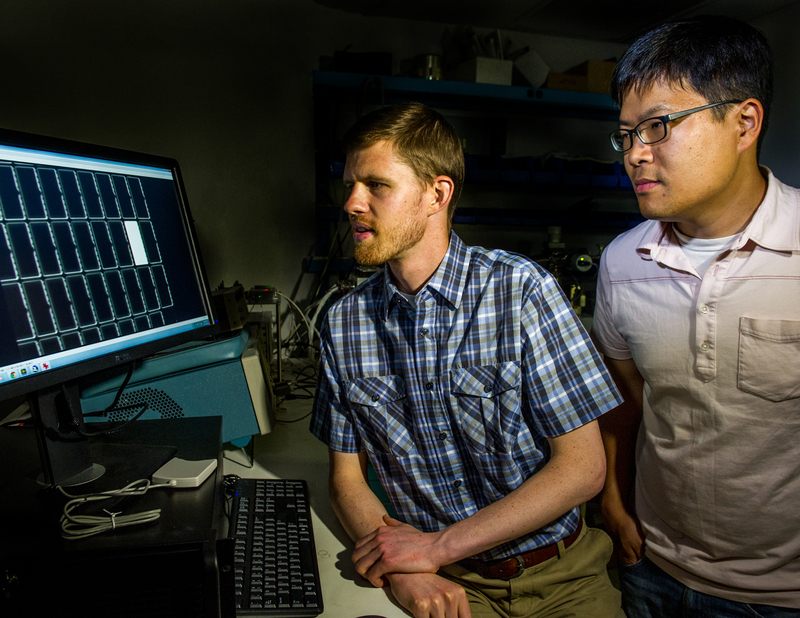 Goddard engineers Devin Burns and Lance Oh are pictured here with the next-generation microshutter arrays. 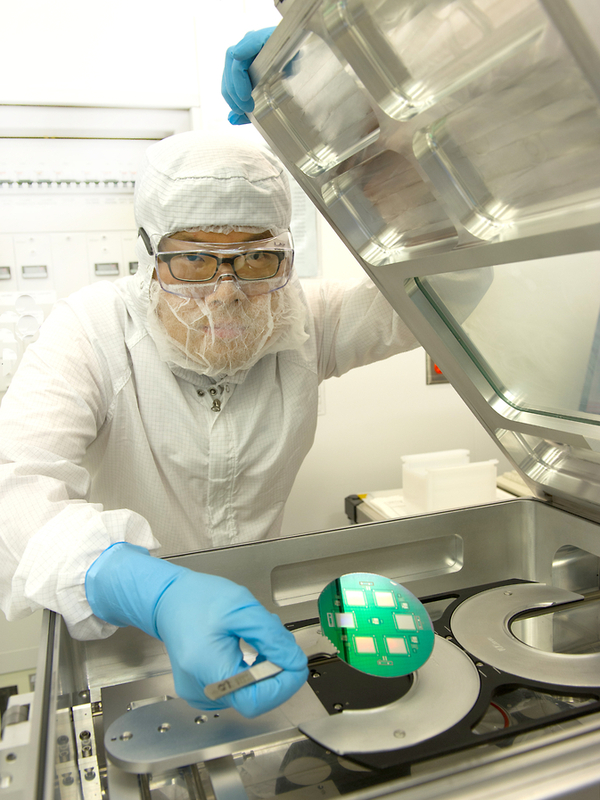 Goddard engineer Lance Oh is one of several technologists developing a next-generation microshutter array technology originally developed for the James Webb Space Telescope. As a result of the progress, Li said three astrophysicists now are interested in applying the technology to their own mission concepts, which include observing nearby star-forming regions in the ultraviolet, studying the origins of astronomical objects to better understand the cosmic order, and understanding how galaxies, stars, and black holes evolve. In fact, one of those scientists is so committed to advancing the microshutter array that he plans to demonstrate it during a sounding-rocket mission next year, Li said. Although spectroscopy — the study of the absorption and emission of light by matter — is the obvious beneficiary of the technology’s advance, Li said it also is applicable to lidar instruments that measure distance by illuminating a target with a laser and analyzing the reflected light. A major automotive company also has expressed interested in the technology, she added. However, before others can use the new and improved microshutter technology, Li said the team must develop an assembly and packaging to house multiple arrays. “If you want to use the microshutter array on a large telescope, we need to make a larger field of view. To make this happen, we need to take multiple arrays and stitch them together,” Li said. Currently, the technology relies on a large computerized switch box — a heavy device unsuitable for spaceflight missions. The team plans to incorporate an integrated circuit, or silicon chip, that drives the switching functions. Placed next to the shutters, the circuit would take up only a fraction of the space. The team currently is identifying circuits from different vendors and plans to begin testing shortly.